Roger Brooke Taney, 1777-1864. Secretary of the Treasury; Chief Justice of the United States, 1836-1864. Autograph Letter Signed, R. B. Taney, one page, 5" x 8", Washington, [D.C.], February 26, 1864. Referring to the illness that ultimately killed him, Taney apologizes for his delay in sending his autograph. In full: “I write this note to comply with your request for my autograph—and thank you for the kind terms in which you have made the request[.] I regret that a severe illness prevented me replying sooner to your letter. With best wishes / Your obt. st / R. B. Taney". 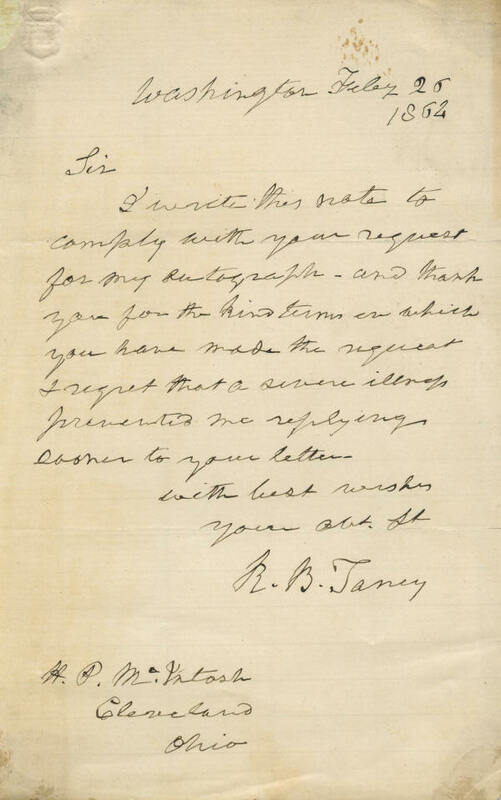 Taney was less than three weeks away from turning 87 years old when he wrote this letter. He was too frail to function effectively as Chief Justice, yet he held on. More than two years before, thinking that death was near, he asked each of his colleagues to call on him before they left Washington for the summer, and he told them he did not expect to see them again. He lived, but he was able to attend court only a few days during the 1863-1864 term. According to his biographer, Carl Brent Swisher, ”his mind continued to function clearly, but his body grew steadily weaker, until his physician remarked on his resemblance to a disembodied spirit.” Taney spent many hours reading in bed, unable to sit up at times. It is perhaps unfortunate that Taney's career as Chief Justice was defined by a single case, the Supreme Court's controversial and ill-fated decision in Dred Scott v. Sanford (1857). In an opinion written by Taney, the Court held that Congress could not forbid slavery in the territories and that the Missouri Compromise therefore was unconstitutional. Some historians argue that the decision led directly to the Civil War. Despite that decision, constitutional scholars rank Taney among the greats justices—alongside the likes of Chief Justice John Marshall and Justice Oliver Wendell Holmes, Jr.
Taney became Chief Justice after the Senate had rejected his nomination for both Secretary of the Treasury and Associate Justice of the Supreme Court. As Attorney General, Taney was President Andrew Jackson's legal advisor during Jackson's crusade against the Second Bank of the United States and wrote much of Jackson's message vetoing the act to recharter the bank. After Jackson was reelected in 1832, Taney advised him to withdraw the government's funds from the bank. When two successive Secretaries of the Treasury, Louis McLane and then William J. Duane, refused to do so, Jackson made Taney the Secretary of the Treasury by a recess appointment. Taney did Jackson's bidding and transferred the funds to various commercial banks. As punishment, the Senate refused to confirm Taney as secretary. In 1835, Jackson nominated Taney to replace Justice Gabriel Duvall as an Associate Justice of the Supreme Court, but the Senate again balked, postponing the confirmation vote indefinitely. Less than a year later, following the death of Chief Justice John Marshall, Jackson nominated Taney for Chief Justice, and ultimately, with the composition of the Senate changed, Taney was confirmed. Taney, a Maryland native, grew up in a slaveholding tobacco plantation family. He graduated first in his class at Dickinson College. He then apprenticed three years with an Annapolis lawyer before being admitted to the bar in 1799. He quickly distinguished himself as one of Maryland's most promising young lawyers. Initially a Federalist, Taney split with the party leadership over the War of 1812, which he supported. Ultimately he gained control of the Maryland Federalists, and in 1816 he was elected to a five-year term in the state senate. He reentered private law practice in 1821 and, after building a large practice, moved from Frederick to Baltimore in 1823. The next year, he permanently abandoned the Federalists to support Andrew Jackson. Jackson named him Attorney General in 1831. This letter is in very good condition.  The integral leaf has been removed, and there are mounting stains and residue in the corners on the back side of the letter, which show through a bit, and some foxing and toning. The handwriting is bold, however, and Taney's signature is excellent. While Taney's autograph material is readily available, much of it is in the form of legal documents from his career as a lawyer and as Secretary of the Treasury. Letters as Chief Justice, particularly from the period this late in his life, are much less common. This is a nice, displayable example.